Telescopes above teamed up with telescopes below to make the most detailed astronomical image to date. NSF-funded National Radio Astronomy Observatory (NRAO) snaps a picture of a huge jet of particles. 15 ground-based telescopes teamed with an orbiting telescope to capture the highest resolution image yet. 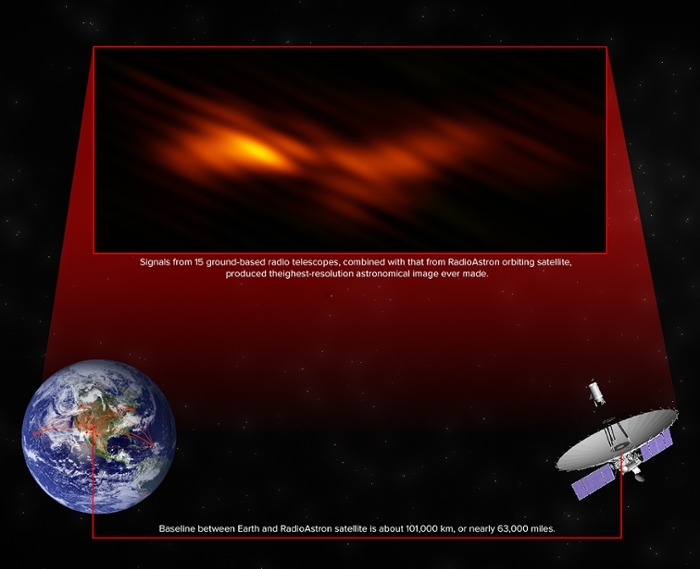 Image shows radio signals emitted by a jet of particles hurled by nearby black hole. Using an orbiting radio-astronomy satellite combined with 15 ground-based radio telescopes, astronomers have snapped the most-detailed astronomical image yet, unmasking a gorging black hole in a galaxy 900 million light-years from Earth. Scientists at the National Radio Astronomy Observatory (NRAO) combined signals from the Spektr-R satellite of the RadioAstron mission with those from radio telescopes throughout Europe and nine antennas of the National Science Foundation's (NSF) Very Long Baseline Array (VLBA). The result was an image with the resolving power of a telescope nearly 63,000 miles wide, or almost eight times the diameter of the Earth. 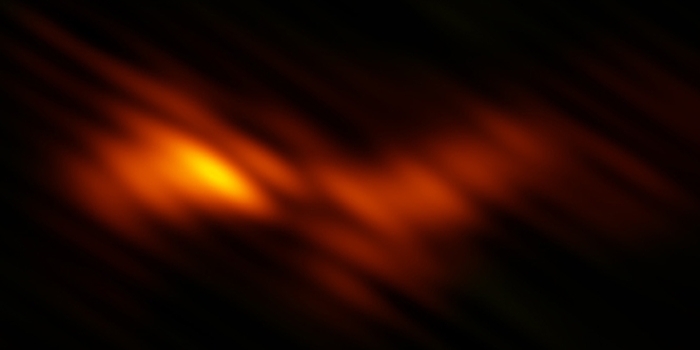 The image shows radio emissions coming from a jet of particles accelerated to nearly light speed by the gravitational power of a supermassive black hole at the core of a galaxy called BL Lacertae. 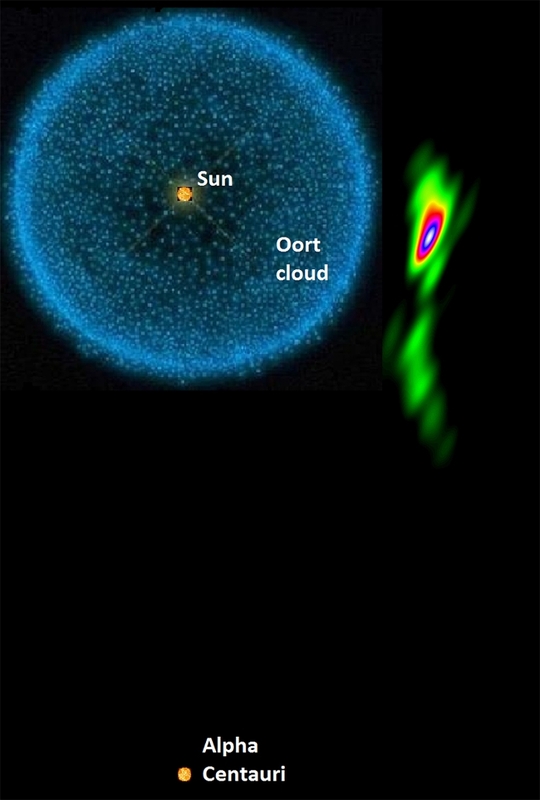 The jet shown by this image would fit within the outer extent of our solar system, marked by the Oort Cloud. Though the image shows detail roughly equivalent to seeing a 50-cent coin on the moon, it appears elongated because the distance between the satellite and the ground telescopes is so much greater than that among the ground telescopes themselves (thus providing greater resolving power in one direction). The Astro Space Center in Moscow leads the satellite project, and scientists combined the data from all 15 telescopes at a facility of the Max Planck Institute for Radio Astronomy in Bonn, Germany. The scientists reported their work in the Astrophysical Journal. The NRAO is a facility of the NSF, operated under cooperative agreement by Associated Universities, Inc.